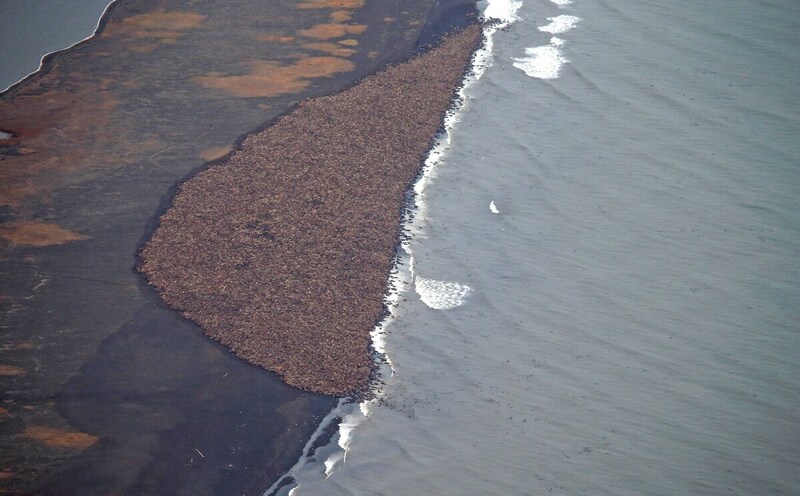 One Picture, Of 35,000 Walrus, Shows One Effect Of Global Warming : The Two-Way The picture shows the walrus huddled up on an Alaskan beach. Usually, they would spread out on sea ice. But this year, it's all melted. In this aerial photo taken on Sept. 27 and provided by NOAA, some 35,000 walrus gather onshore near Point Lay, Alaska. It was released by NOAA's Aerial Surveys of Arctic Marine Mammals and shows an estimated 35,000 walrus "hauling out" on an Alaskan beach. This is not normally how you would find them. The animals would normally be spread out on the sea ice, but, as you see in the picture, this year the ice has all melted. "The number of walruses had mushroomed from an aerial survey only four days earlier, when just 1,500 were spotted at the haul-out near Point Lay. About 50 dead walruses were spotted in that count. "A NOAA release from 2013 calls the large haul-outs a relatively new phenomenon. Last year, a NOAA survey counted about 10,000 walruses on the beach near Point Lay. In 2011, about 30,000 came ashore. The large haul-outs were first noticed in 2007, NOAA said." The World Wildlife Fund, for its part, says this picture shows one effect of global warming. "The massive concentration of walruses onshore — when they should be scattered broadly in ice-covered waters — is just one example of the impacts of climate change on the distribution of marine species in the Arctic," Margaret Williams, managing director of WWF's Arctic program, said in a statement. Lou Leonard, WWF's vice president for climate change, said the loss of arctic ice "will impact the annual migration of wildlife through the region, threaten the long-term health of walrus and polar bear populations..."